This February’s warm weather is nice in the Northeast, but apple farmers may pay a price if winter roars back. To help growers assess precarious temperatures in turbulent springs, the Cornell Institute for Climate Smart Solutions has developed a new Apple Freeze Risk decision tool. “I think the warm weather we’re seeing this week may push the apple trees into vulnerable stages,” said Art DeGaetano, professor of earth and atmospheric sciences and director of Cornell’s Northeast Regional Climate Center. 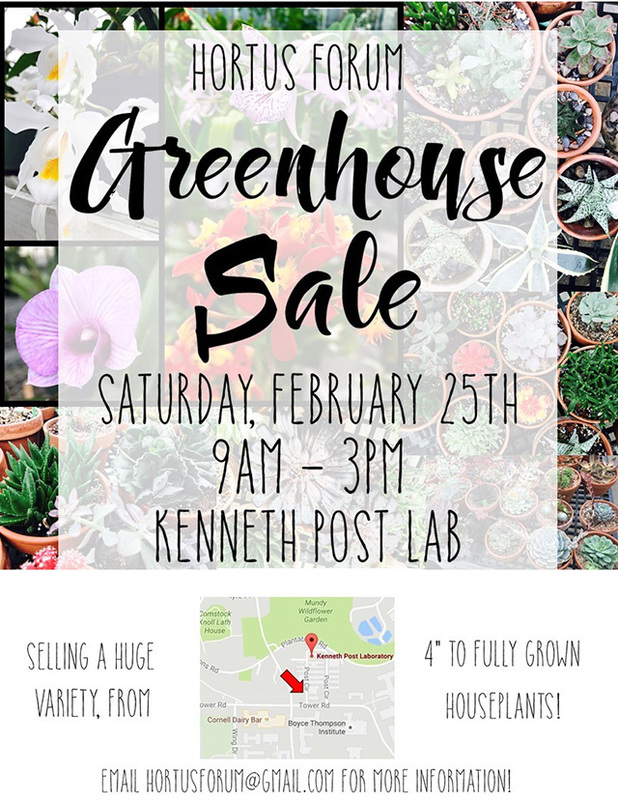 Hortus Forum, Cornell’s undergraduate horticulture club is holding their blowout sale today (February 25) from 9 a.m. to 3 p.m. at the Kenneth Post Lab Greenhouses (map). 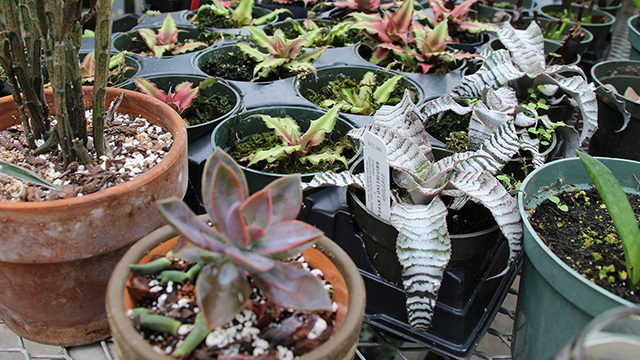 They’re selling a huge variety of houseplants from 4″ to fully grown. 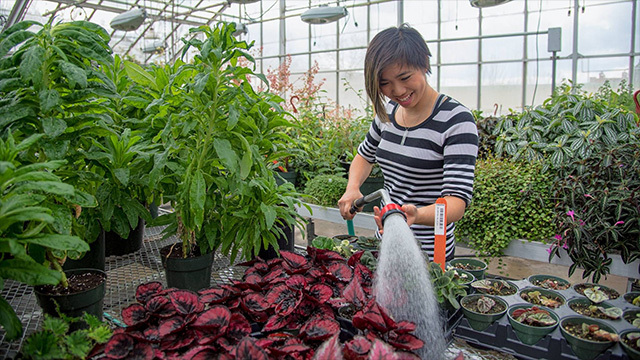 Patty Chan ’18 waters plants in preparation for the sale. 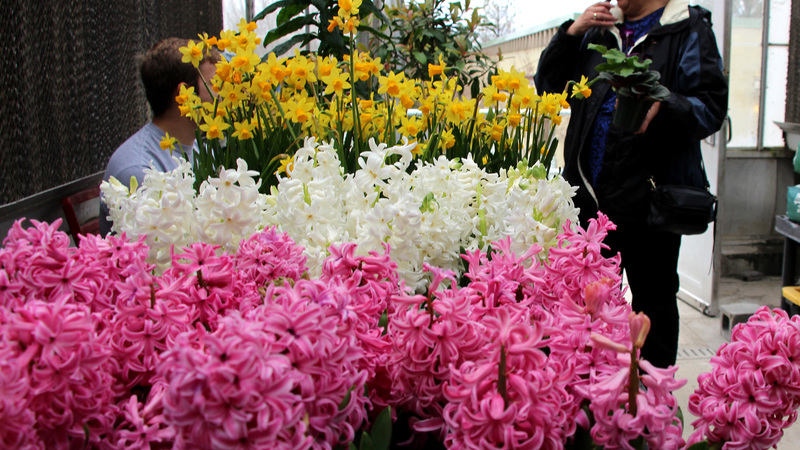 Update [10 a.m.]: Early sales are brisk. 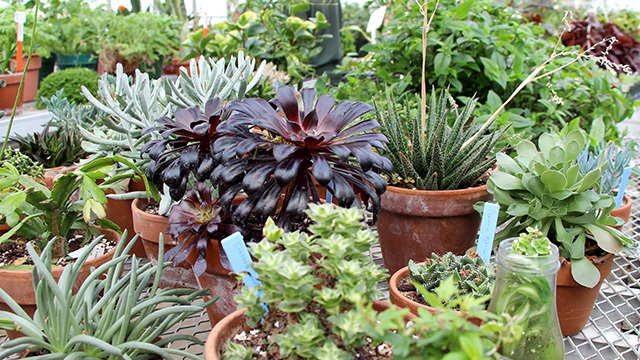 But there are still tons of interesting and unique plants to be had. 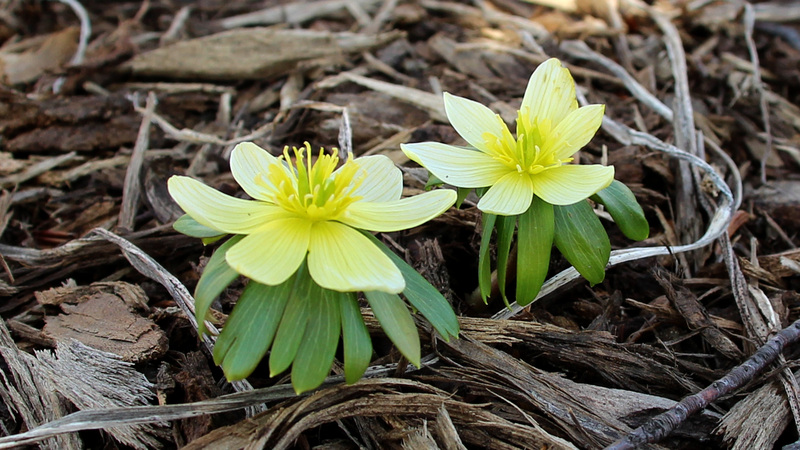 Record-breaking temperatures this week fueled early flowering of spring ephemerals in Minns Garden, including winter aconites (Eranthus hyemalis) and snowdrops (Galanthus nivalis). 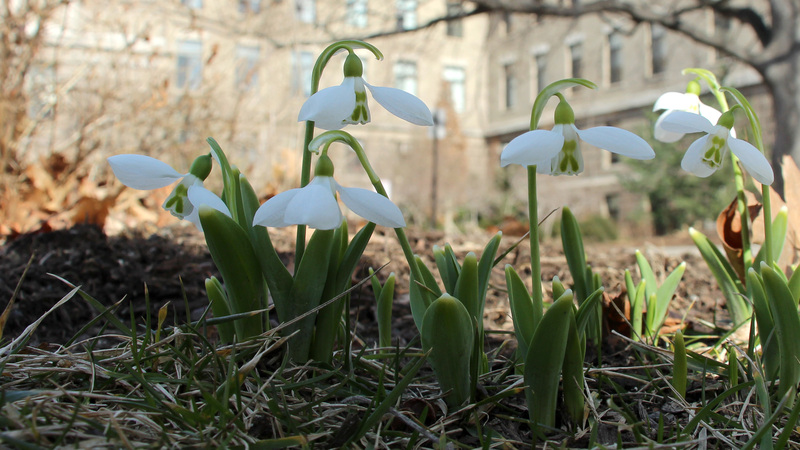 If you visit the garden (located between Plant Science Building and Tower Road), you’ll also notice that Cornell Grounds Staff used the exceptional weather to remove much of the failing 80-year-old yew hedge that enclosed the garden, foretelling some major changes for the garden this summer. Selling a huge variety of houseplants from 4″ to fully grown. 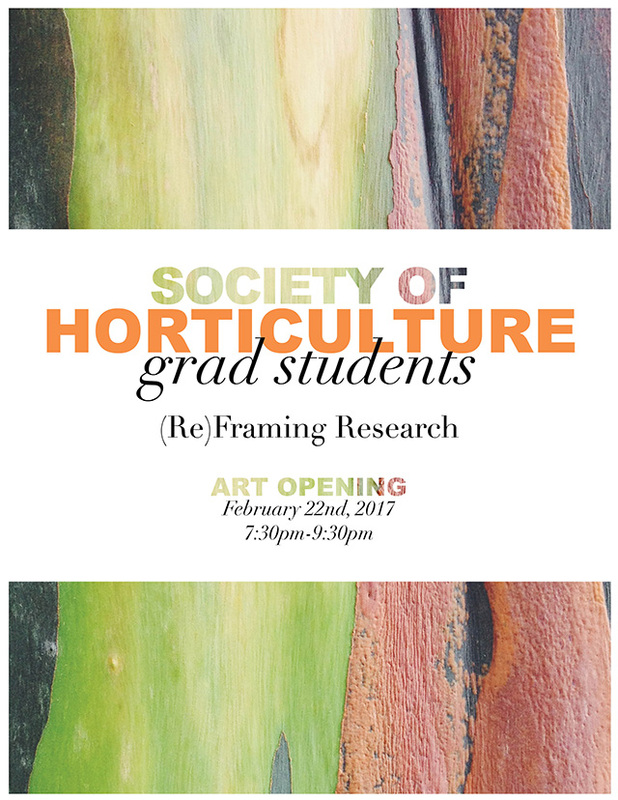 The Society of Horticulture Grad Students (SoHo) is proud to present their horticultural research through an artistic lens at the Big Red Barn. From the flowers above ground to the mycorrhizae systems deep below ground, the beauty of horticulture is everywhere. This collection of pieces showcases the diversity of horticultural research at Cornell University and seeks to highlight SoHo’s deep appreciation for the intricate connection between people and plants. 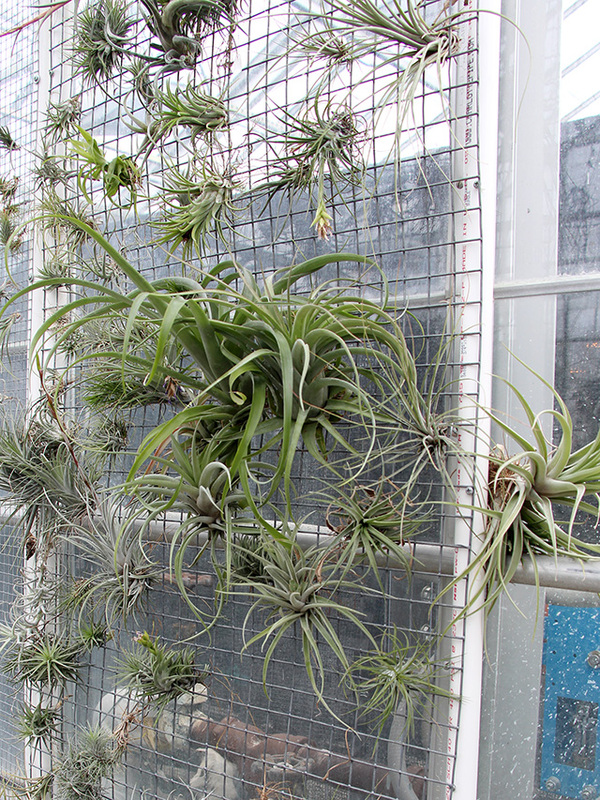 We hope you’re able to join us for the show’s opening at the Big Red Barn, opening February 22, 7:30 PM – 9:30 PM! Free wine and cheese will be served. If you missed Monday’s Horticulture Section seminar Growing berries in northern Europe with Pauliina Palonen, University of Helsinki, it is available online. 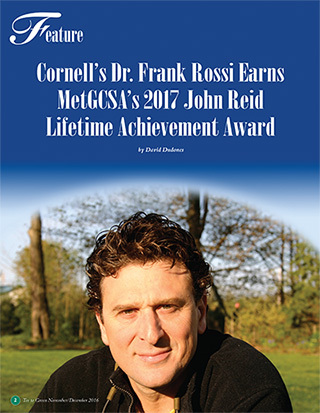 The Metropolitan Golf Course Superintendents Association (MetGCSA) presented its John Reid Lifetime Achievement Award to Frank Rossi, turf specialist and associate professor in the Horticulture Section, at its January 18 Winter Seminar. The award recognizes individuals or organizations that, through continuing commitment, show exemplary support to the game of golf and golf course superintendents. Read more in Tee to Green. 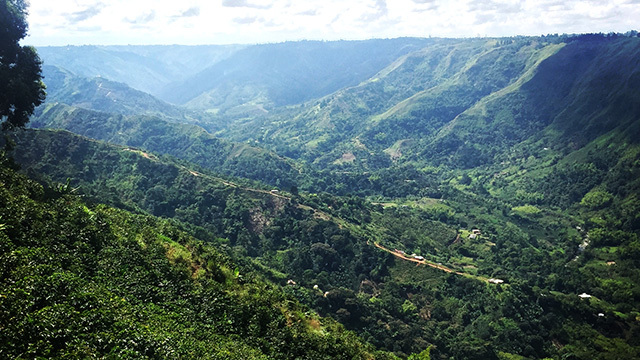 Tucked away in the western arm of the mighty Colombian Andes lies the Cauca coffee-growing region. A stunning mixture of Afrocolombians, indigenous people and Spanish descendants fuses together around the culture of artisanal coffee growing. Without machinery and with very few inputs — but enormous amounts of creativity — these farmers optimize yield in plots usually less than 2 acres. And even in the face of unpredictable weather, they manage to put children through college, pay off their loans, and experiment with organic farming. 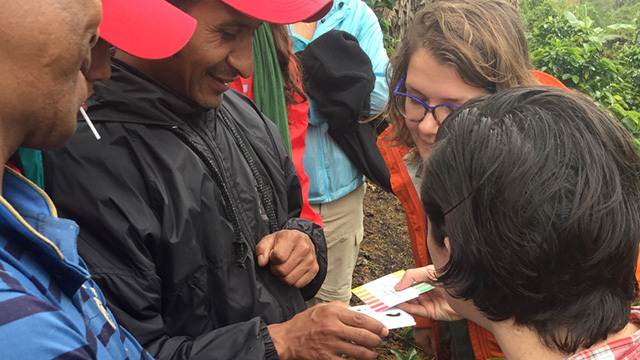 In January, we led a student learning and research trip to Cauca as part of the Student Multidisciplinary Applied Research Team (SMART) program of the Cornell International Institute for Food, Agriculture and Development (CIIFAD). 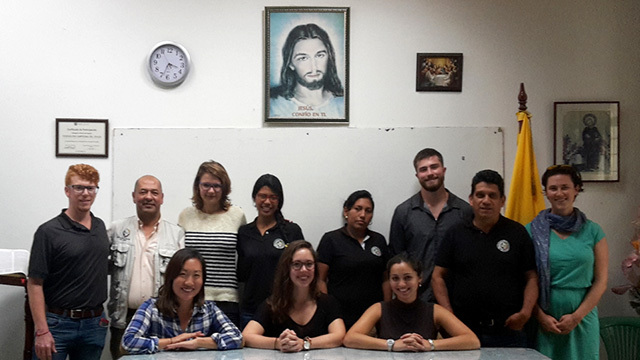 We made use of a previously established relationship with a cooperative of coffee farmers, Federación Campesina de Cauca (FCC), by Miguel Gomez and his graduate students in Applied Economics and Management. Our group consisted of students from different disciplines and included Shanti Kumar and Jenny Lee from International Agriculture and Rural Development, Sam Bosco from Horticulture, Lizzy Sweitzer Cornell Institute of Public Affairs, and Whit Knickerbocker from Agronomy and Agribusiness Management. During our visit, the team visited both organic and conventional coffee farms with the aim to better understand the economic, social and environmental challenges and opportunities that households from these different food production systems face. We interviewed the farmers about their management practices and took soil samples to evaluate pH and active carbon content of the soil. 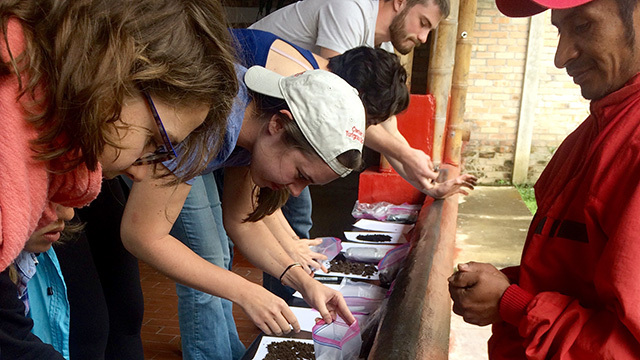 As an outcome, we left the FCC with a low-cost alternative to expensive lab soil tests that can inform them of soil health status and better direct their limited resources. Full of pride and also of knowledge, the coffee producers showed the team around their farms and explained their philosophy and techniques. Even though communicating in Spanish wasn’t always easy, the producers were very patient in explaining their perspectives and sharing their experiences. 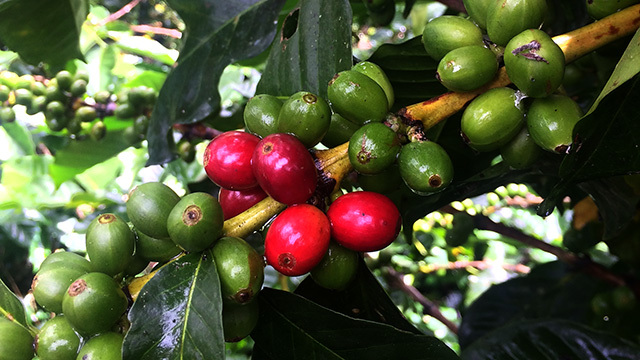 Coffee farming is a tough living; stories of fluctuating coffee prices, health issues due to pesticide exposure and climate change were part of almost every conversation. 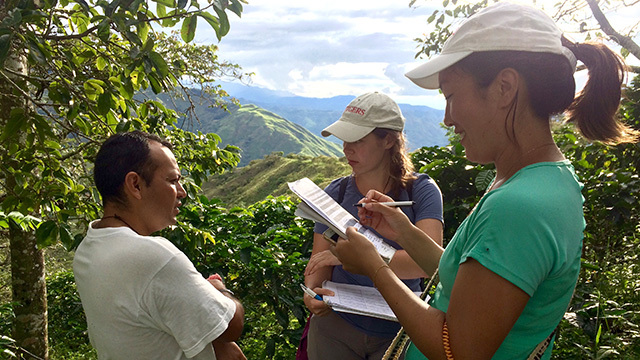 The prospect of a peace deal finally put into action brings a smile to the farmer’s faces, but their reality is still one of political turmoil, government neglect, and ever present coffee leaf rust. Besides the remarkable views of the endless mountains, one of the things that stood out was the hospitality and openness of the farmers. We were not allowed to leave the farm without having had at least one cup of sugary coffee, and a sampler of the tropical fruits grown by the family. Seeing all of this with your own eyes makes you think hard about the coffee we drink every day. 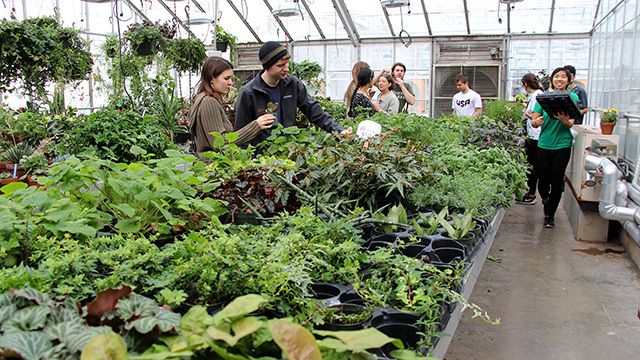 If you missed Thursday’s Soil and Crop Sciences Section seminar New vegetables for organic systems with Michael Mazourek, it is available online.